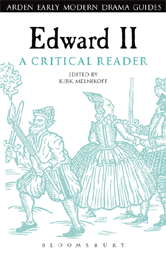 Edward II: A Critical Reader gives students, teachers and scholars alike an overview of the play's reception both in the theatre and among artists and critics, from the end of the 16th century to the beginning of the 21st. The volume also offers a series of new perspectives on the play by leading experts in the field of early modern history and culture. 7 ‘My Life, My Company’: Amity, Enmity and Vitality in Edward II - Garrett A. Sullivan, Jr.